Provo • Hours after announcing his campaign for U.S. Senate, Mitt Romney spent his first speech as a candidate making the case to a roomful of Republicans that he is conservative enough and Utahn enough — just maybe not as young as they might think. 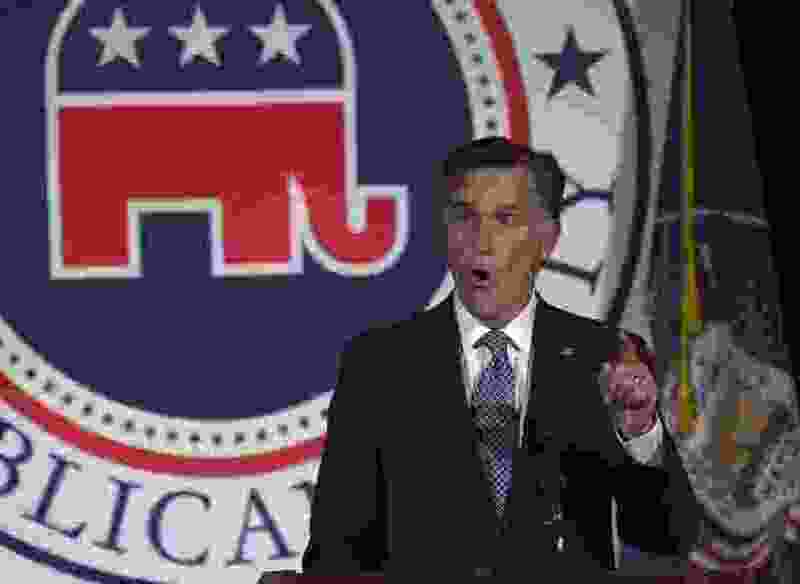 The 2012 GOP presidential candidate and former governor of Massachusetts is vying for the seat being vacated by retiring seven-term Sen. Orrin Hatch, R-Utah. With no other established Republican in the race, Romney is the front-runner and presumptive nominee. He outlined the concerns that drove him into the race during his nearly 40-minute address at a Utah County fundraiser Friday night. Solving intergenerational poverty. Reducing carbon emissions. Shrinking the national debt. Lowering the cost of health care. Restructuring federal land management. Romney lingered longer on one issue: school shootings. He was originally scheduled to announce his bid Thursday but pushed it back “out of respect for the victims and their families” after a gunman killed 17 people at a Florida high school. He encouraged states to consider solutions like building security, police patrols and intervention teams. He also said he would back a measure to bolster the federal database for firearms background checks. About 14 hours earlier, Romney launched his bid with a video on social media. The two-minute post, which features panoramas of Utah’s mountains and farms, families and workers, credits the state for welcoming “legal immigrants from around the world” while “Washington sends immigrants a message of exclusion.” He also said people in Utah’s Capitol treat each other with respect. Those jabs could easily be leveled at President Donald Trump, who often calls his political opponents names and has removed protections for immigrants brought to the country as children, often called “Dreamers.” Romney has not supported many of Trump’s immigration proposals and specifically denounced him for calling Haiti, El Salvador and some African nations “s---hole countries” last month. Romney has a strong base in Utah, where he’s popular among Mormons and won his highest vote margin — nearly 50 points — over President Barack Obama in the 2012 race. He made the state his official residence two years later and currently lives in Holladay. He went to college here. His son was born here. Nine of his grandkids live here. He led the 2002 Winter Olympics here. This is my home, he argued to the audience. “I think the people of Utah know that I’m a Utahn at heart,” he told reporters after the event. 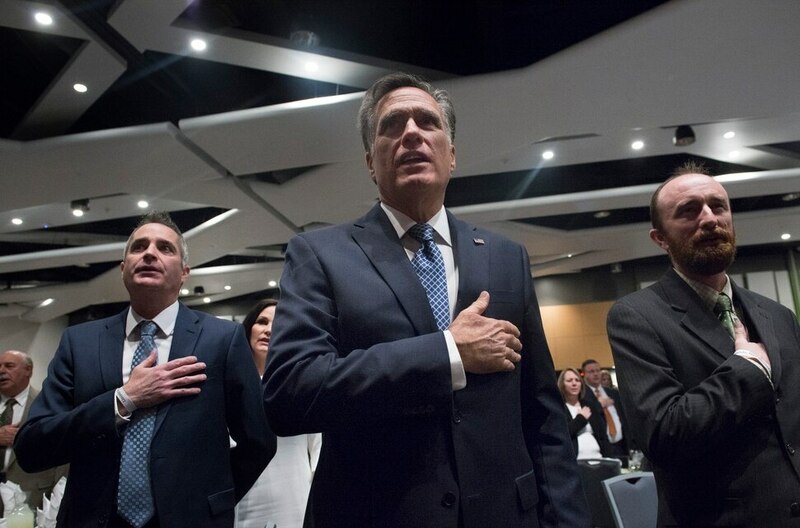 Scott Sommerdorf | The Salt Lake Tribune Former Republican presidential candidate Mitt Romney stands for the pledge of allegiance Friday, February, 16, 2018. Romney is the keynote speaker at the 2018 Utah County Republican Party Lincoln Day Dinner. 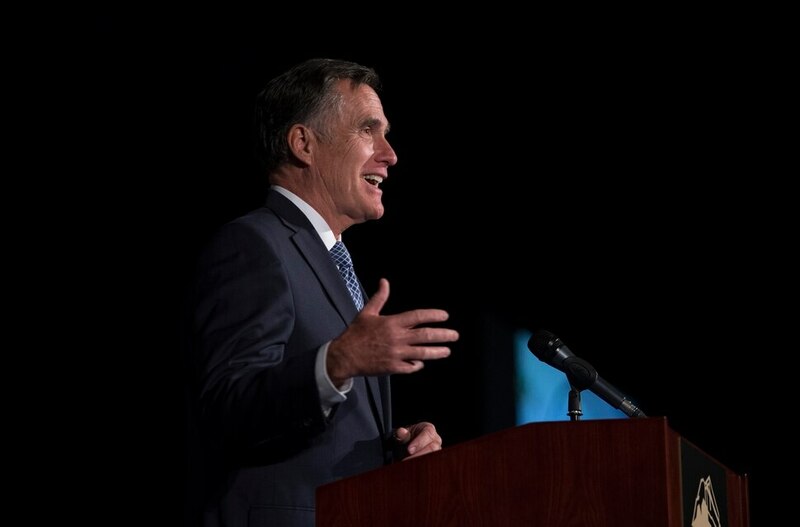 Scott Sommerdorf | The Salt Lake Tribune Former Republican presidential candidate Mitt Romney speaks at the 2018 Utah County Republican Party Lincoln Day Dinner. Scott Sommerdorf | The Salt Lake Tribune Former Republican presidential candidate Mitt Romney speaks at the 2018 Utah County Republican Party Lincoln Day Dinner. Scott Sommerdorf | The Salt Lake Tribune Former Republican presidential candidate Mitt Romney speaks at the 2018 Utah County Republican Party Lincoln Day Dinner. Scott Sommerdorf | The Salt Lake Tribune Former Republican presidential candidate Mitt Romney speaks at the 2018 Utah County Republican Party Lincoln Day Dinner. Scott Sommerdorf | The Salt Lake Tribune Former Republican presidential candidate Mitt Romney speaks at the 2018 Utah County Republican Party Lincoln Day Dinner. Scott Sommerdorf | The Salt Lake Tribune Former Republican presidential candidate Mitt Romney speaks at the 2018 Utah County Republican Party Lincoln Day Dinner. 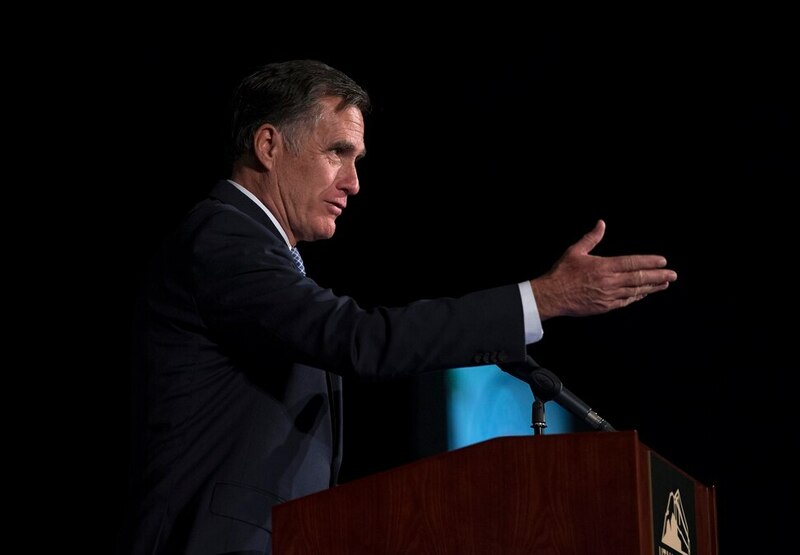 Scott Sommerdorf | The Salt Lake Tribune Former Republican presidential candidate Mitt Romney speaks at the 2018 Utah County Republican Party Lincoln Day Dinner. Scott Sommerdorf | The Salt Lake Tribune Senator Orrin Hatch, R-Utah, spoke to the 2018 Utah County Republican Party Lincoln Day Dinner via a recorded message prior to former Republican presidential candidate Mitt Romney delivering his keynote address. Scott Sommerdorf | The Salt Lake Tribune Senator Mike Lee, R-Utah, speaks at the 2018 Utah County Republican Party Lincoln Day Dinner. Scott Sommerdorf | The Salt Lake Tribune Representative John Curtis, R-Utah, speaks at the 2018 Utah County Republican Party Lincoln Day Dinner. Scott Sommerdorf | The Salt Lake Tribune Utah Representative Mia Love, R-Utah, speaks at the 2018 Utah County Republican Party Lincoln Day Dinner. A Salt Lake Tribune-Hinckley Institute of Politics poll conducted in January showed that he would handily win a Senate election here. About 64 percent of those surveyed said they’d back Romney; 19 percent would choose Democrat Jenny Wilson. “His campaign has my unwavering support, and the people of Utah will be getting an accomplished and decent man when they make him their next senator,” said House Speaker Paul Ryan, Romney’s 2012 running mate. It was a highly unusual move for the GOP chief, and he later apologized to Romney, who reached out to him after The Tribune’s story was published. But others continue to have similar concerns. Romney has eyed the race for months, building a campaign team and a strategy, waiting for Hatch’s decision to step aside at the end of his current term. In preparation for launching the campaign, he disclosed that he underwent surgery for prostate cancer last year. As one of the most popular politicians in the state, even drawing support from nearly one-fifth of Democrats in the Tribune-Hinckley poll, it appears a health scare would be the most likely thing to keep him from the general election ballot and a likely victory. But he still could face a challenge from a sitting Republican officeholder. Dougall, a former state lawmaker, suggests it’s frustrating that Romney is the “presupposed” winner before he’s faced any competition. “Utahns deserve a conversation, not a coronation,” he said. On the left, there’s Wilson. She serves as a Salt Lake County councilwoman and grew up in Utah — which she offers as a counterpoint to Romney. The last time Utah had an open Senate seat was in 1992, when Sen. Jake Garn stepped down after three terms and Bob Bennett won the office after a hard-fought primary with former Geneva Steel Chairman Joe Cannon and general election against the Democrat Wayne Owens, a former congressman.